First LA co-write with Rick Seibold. UChic’s very first Star Brand Ambassador, 16-year-old Gracie Schram is an up-and-coming singer/songwriter who shares the ‘Live Your Dreams’ mantra through her music and philanthropy. She was also funded through the UChic 1000Dreams Campaign. The fund helped Gracie take a trip to LA in April. There her week was busy with writing, meetings and a show or two. Gracie sent us an update about her trip and we wanted to share it with you! Also some exciting news! 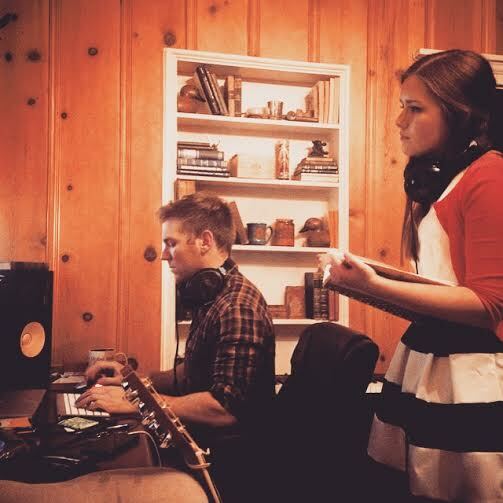 Gracie will be officially releasing her debut studio album, i am me on 5-5-15! First of all, I have to give a shout out to UChic for helping fund this adventure to LA as a part of their #1000Dreams campaign and for allowing me to pursue my dream in music! You guys are wonderful! Oh LA, where do I start… LA is beautiful. It’s a beautiful place filled with amazing people and I feel like I’m falling in love with the city more and more every time I go. This was my third time to LA and I was ecstatic to be back. LA is weather is probably one of my favorite things. Naturally coming from chilly Kansas City winter I was so excited for sunny LA, but the weather was the least of my excitements. I had a trip filled with performing, meetings, and seeing friends. On Tuesday I had my first writing session in LA. It was a long co-write, but I think I came out with a cool tune. I wrote with Rick Seibold who I’d never met before but he was great. He had just come back from Nashville which was ironic because I was just there and we knew a ton of the same people. Wednesday was super busy. I started off meeting with the head of music at MTV which was very cool. Then I headed to USC for my very first college tour. My friend Sarah McMullen who is also a musician showed me around campus. I’m still in shock that I’ll be a senior next year. On one hand I feel like I’m ready to move on from high school but on the other hand I kind can’t believe that I’ll be on my own in a year. Eeeekk! I do miss out on a lot of the typical “high school experience,” but I’m still a teenager who does teenage things like going to prom which is next week for me. This is my first prom so I don’t really know what to expect but I’m super excited, mostly about my dress. I headed right from USC to a meeting with my amazing booking agency, CAA. If you have any events that you’d like for me to come to please reach out with info to jadlerasst@caa.com and I’ll see if I can make it. I finished out my Wednesday having dinner at my favorite restaurant in LA, Il Piccolino. My sweet mom and I had dinner with our friend Jennifer who we met early this year at the 30A Songwriters Festival in Florida. It was one of the best meals I’ve had in forever; I left so full and so happy! To get the full story and to see all of the amazing photos from Gracie’s LA adventure visit her website. And don’t forget Gracie will be releasing her debut studio album, i am me on 5-5-15!